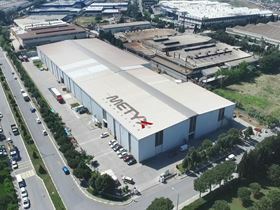 METYX Composites factory on the Manisa Industrial Zone, Turkey. The existing factory is being linked to a newly acquired site, which combined provide a total of 2.3 hectares (23,000 m2) of production and warehousing space. The expanded site is almost twice the size of the current factory, providing the company with the space to double weaving capacity for glass and carbon fiber multiaxial fabrics and add more tooling and kitting capacity. The expanded METYX factory will include additional new production lines for both glass and carbon fiber multiaxial fabrics and new CNC machining centres for composite plug and mold making. To meet increasing demand, especially from the wind energy sector locally, existing kitting services at Manisa are also being further expanded. Additional new warehousing facilities are also being constructed to improve stock holding and distribution services from the main production site. This latest investment in the expansion of METYX Composites is part of an ongoing five-year program of investments in production facilities for technical textiles and composites-related products made by Telateks since 2011. The new site is planned to be fully operational later this year, with additional staff being recruited. Metyx says that its composite facility inn Kaposvár, Hungary, has been expanded, adding an additional 3,024 m2 of storage space. Turkish company Metyx Group has installed new warp knitting production lines.